Plans for New Zealand's tallest skyscaper, to rise in the heart of Auckland, have been unveiled today. A $350 million 52-level 209m skyscraper has been announced for a CBD site left vacant since the 1980s when Chase Corporation demolished the Royal International Hotel. 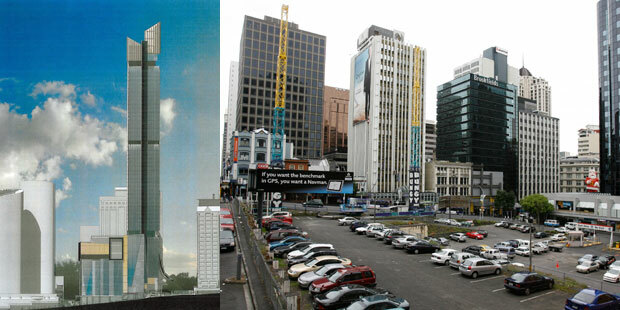 Chinese developer New Development Group is to build the tower, known now as NDG Auckland Centre, on the site of a carpark and bungy jump bounded by Elliot St, Albert St and Victoria St.
Auckland Council has granted resource consent for the giant which will only be dwarfed by the 328m Sky Tower. A building consent is still pending. Mayor Len Brown announced details of the tower to the Herald this morning, saying it would be a huge transformation for the city. "Alongside the Sky Tower, this will be a world class development for Auckland that will create hundreds of new jobs, energise the CBD and boost Auckland's GDP, through a more than $350 million investment by NDG," Brown said. "It's also an example of the major commercial opportunities created by the City Rail Link project. To date the private sector has confirmed more than a billion dollars of new investments along the proposed route, including Precinct Properties' downtown retail and office development ($300m+) the NZ International Convention Centre ($400m+) and Elliott Towers ($350m+)," he said. Interesting, reminds me of Melbourne's Zen. The proposed new Elliott St tower fills a hole in the ground, but does it fulfill the needs of the city? What will we call it? That’s one of many questions to be asked about the newly consented, 52-storey, 209m Elliott St tower. Elegant, awful, ho-hum? One architect I spoke to described it, possibly diplomatically, as “a tough-looking building”. If it gets built, Elliott Tower will be around 50m taller than its nearest rival, the Vero Centre, and subservient only to the 328m Sky Tower. It would be great if more Aucklanders ventured an opinion about what happens to our city skyline and what will be Auckland’s second-tallest building. Planning work for New Zealand's tallest new skyscraper is going on behind the scenes. No site works have begun, but work is on to establish the team to build the 52-level NDG Auckland Centre in Auckland's heart. Ludo Campbell-Reid, Auckland Council's design champion and environmental strategy and policy department manager, said his organisation had been in touch with the team from Chinese-headquartered NDG. The building will rise on the site between Albert St, Victoria St and Elliott St, and is named after the Shanghai-based New Development Group, headed by Furu Ding. Auckland mayor Len Brown announced the huge new tower in February, saying resource consent had been granted for the block which would be 119m shorter than the Sky Tower. "resource consent"? Permit to close of streets for construction vehicles/materials access? 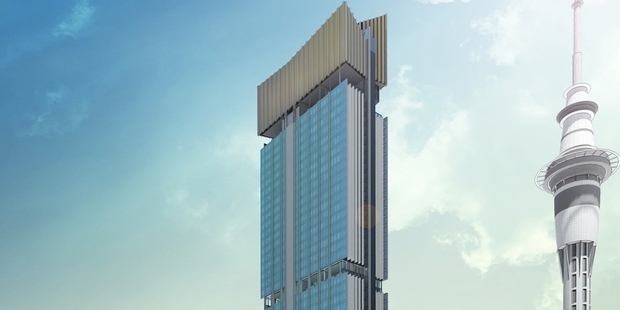 Construction work on New Zealand's second-tallest building will start next year. A spokesman for Chinese developer NDG said plans for the 52-level NDG tower in Auckland's centre were in hand. "Everything is going well and construction will commence according to plan next year," the spokesman said. The completion date is set as 2020.